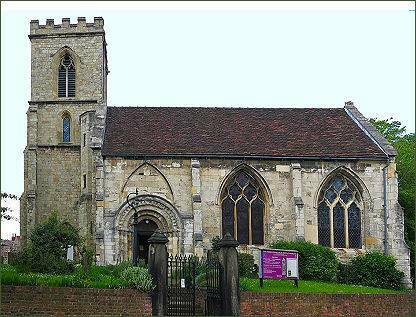 The church of St Denys, a small Grade I listed building, is among the oldest surviving of York's city centre churches and stands on Walmgate which runs from Foss Bridge to Walmgate Bar. The church is one of about 40 in England to be dedicated to St Denys, patron saint of France and Paris, Denys (also called Dionysius or Dennis) was a Christian missionary and Bishop of Paris who was martyred by the Romans along with his companions Rusticus and Eleutherius, in connection with the Decian persecution of Christians, in AD 258 at the place later called 'Montmartre', and was buried in what became the abbey of Saint-Denis in Paris. The church had a close connection with the influential Percy family, Earls of Northumberland, as their town house stood opposite and several Percy family members are buried there including Henry Percy, the 3rd Earl and his brother Richard, both of whom died fighting on the Lancastrian side at the battle of Towton in 1461. St Denys church was founded sometime before 1154, and occupies the site of a late Anglo-Saxon church and possibly an earlier Roman temple. A Roman altar dedicated to the god Arciaco and an Anglo-Danish hogback tombstone were discovered on the site in 1846. These hogback stones have been dated to the tenth or eleventh century and are now on display in the Yorkshire Museum. The present building dates mainly from the fourteenth and fifteenth centuries, St. Denys is often referred to as ‘the unlucky church’, as a result of several mishaps which have occured to the building over the centuries which have reduced its size and resulted in its present square shape. The building was originally much larger than the one we see today, part of it subsided after the the King’s Fishpool was drained at the end of the eighteenth century. A further part of the building collapsed after the construction of a nearby sewer. In the seventeenth century, during the Civil War, the church spire was hit by cannon shot, it was also struck by lightning in the eighteenth century. The spire remained standing but was partially blown down in high winds a few years later after which it was removed for safety reasons. The transepts and long nave were demolished in 1797. In 1847 the present tower was built along with new west walls. The church is entered through an imposing Norman doorway (pictured left), which is set in what was originally a window opening. It was moved here after the nave was shortened in the late eighteenth century. Four twelfth century Norman heads have been repositioned high above the south arches of the south aisle. The present west walls and a new tower were added in 1846-7, when a tiled reredos was also added. In the North Aisle is a fifteenth century font and an iron-bound wooden chest which dates to Elizabethan times. The fifteenth century heraldic roof is also a noteworthy feature. One of the most attractive and interesting features of the building is the array of mediaeval stained glass in seven of its ten windows, which dates mainly of the fourteenth and fifteenth centuries, but also includes two reset twelfth century roundels, the oldest stained glass in York. 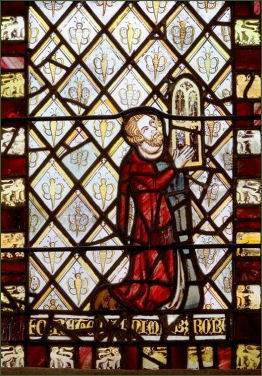 The figure of St Denys can be seen in the east window, and was probably bequeathed by the Percy family as it once included depictions of Percy family members.